BTW, Another point you may wish to address, is that with these phoneme-oriented scripts, the critical matter rests on the pronunciation. If there are two distinct pronunciations, this would in turn validate two distinct writings. But one does wonder if one preceded the other. even the om-kara (the familiar sanskrit symbol) is a “shorthand” that obscures precisely what might have been the intended pronunciation (i.e., it lacks flags, the traditional marker of distinction between o and au). om/aum are both recognizable variations of a transliteration, and while om is the most common, it too is a product of vowel coalescence, a fact brought out by the a-u-m version. What is most important to understand is that, in sanskrit, there is a phonetic rule: “O” = “A” + “U” (if you say a-u really quick, it starts to sound like ‘o’). Thus, it is really just a matter of whether you want to articulate all the different phonetic ‘bits’, and different groups may choose either/or for variant didactic reasons. Thanks for the fun and stimulating blog! I just want to add that nature herself at times seems to support the subscribed ‘a in the om. I’ve noticed it in naturally formed (or self-produced; rang-byung) om-s that appear as white crystals emerging from black rock at Yerpa in Tibet. The only published example of this I know about right off the bat is on the cover of the program for the 7th IATS (Int’l Assoc. 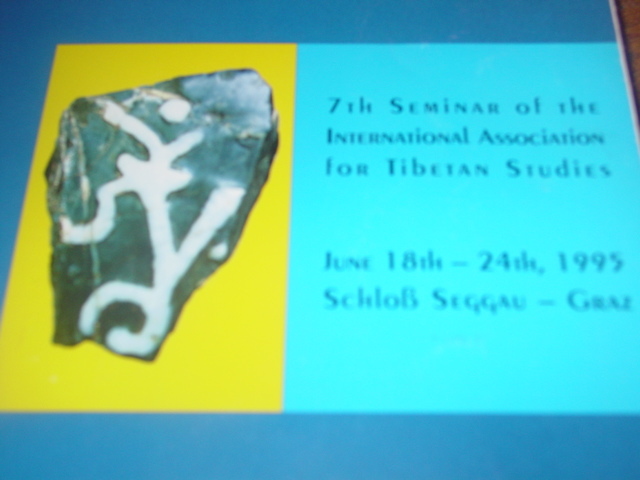 for Tibetan Studies) meeting at Schloss Seggau (near Graz), Austria (a photo taken by Ernst Steinkellner at Yerpa). I just dug up the program, and I have to say that its form is very much like the ‘flying om-s’ of Dunhuang (only without the wing thing going on). Veeery eeeenteresting! Keep up the good blogging! While the a-chung is not needed from a ortographic point of view, it may be necessary for the purposes of Tantric ritual– a syllable is used not only to represent a sound, but its graphic form is utilized in visualizations, etc. 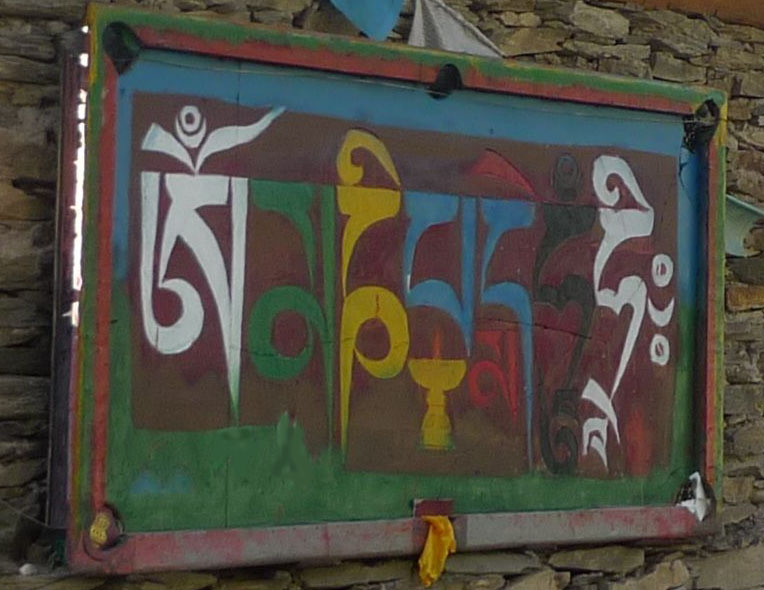 According to the biography of Chokgyur Lingpa, Jamyang Khyentse Wangpo argued that the presence of a-chung is required “for the five wisdoms to be complete”. Without it, the syllable would have only four elements. So it could be that the divergent spellings have something to do with whether this aspect of the syllable is relevant in a given ritual tradition or not. Many thanks for the comments and reference (for those who are interested, it’s on page 19 of Chokgyur Lingpa’s biography, which can be downloaded from the above link in Ratna’s comment). Its good to know that others, more erudite than myself, have had this debate as well! Very effective as a kind of propaganda. The 11 faces are said to have split apart after seeing the suffering in the world (shattered out of compassion…) has turned into something barbaric in the extreme. 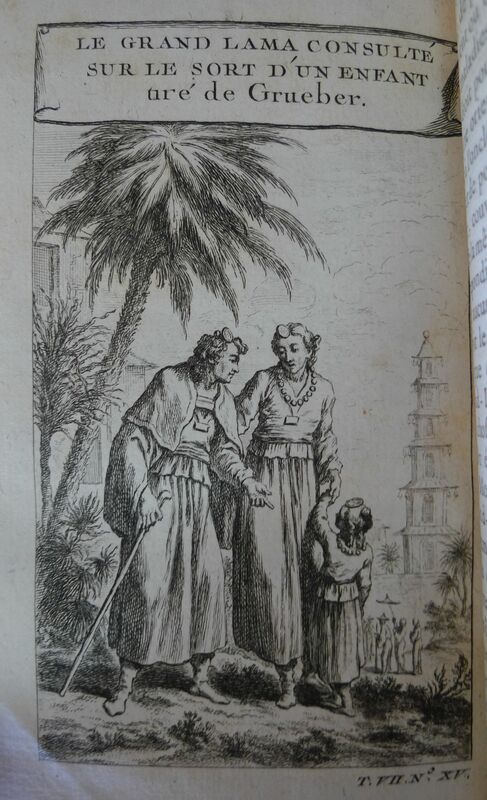 Taken from a 1749 work, Histoire des Voyages, but based on the images found in Kircher, which were in turn based on descriptions by the Jesuit missionary Johann Grueber. Great that this topic is being discussed, it is a point i have mused over many times and good to see some investigation taking place. Dear G., Just a heads up. I have it by very good authority that the Lost Yak will soon be awarded with a Liebster Award for blogging. Congratulations. You earned it. Your D.
Many thanks, Dan. This Liebster thing has a slightly odd ring to it, but whatever. This is the internet, after all, the whole thing is kind of odd. In any case, I definitely appreciate the vote of confidence, and have passed the honor along to Robert and Cathy over at kīlī kīlaya and Sam at Early Tibet. Both far more worthy of actually having anybody read their work than I am!